Late Sh. Kailash Sankhala, widely known as Tiger Man of India, was the first conservationist who raised a voice in favor of protecting the tiger as early as 1956. He spread the message to help tigers from the brink of extinction in an age when hunting tigers was practiced. Kailash Sankhala carried this mission throughout his life, even at the risk of his professional career and death threats. Kailash Sankhala conducted an extensive study on tigers under the Jawaharlal Nehru Fellowship during a time when the tiger population was dwindling at an alarming rate due to poaching and hunting. 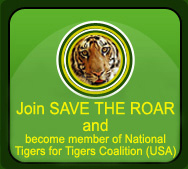 His research lead into the launch of Project Tiger in 1973. He won many awards for his efforts, including the National Honor of Padamshri in 1992. In 1989, he established the Tiger Trust to continue his commitment to tiger conservation. He died on August 15, 1994 in Jaipur. The city of Jaipur in the state of Rajasthan has a street bearing his name: "Kailash Sankhala Marg." The Godwan Society (Desert Wildlife Conservation Society) of Jodhpur has established a Kailash Sankhala Desert Conservation Award. Annual Kailash Sankhala Memorial Lecture is being organized by the Godwan Society of Jodhpur Nature Club of Rajasthan at Jaipur, Tiger Trust and World Wide Fund for Nature (WWF) at Delhi. Late. Shri. Pradeep Sankhala Pradeep Sankhala son of late Kailash Sankhala who took over the charge of tiger trust after his death, he was a pioneer in eco-tourism. He traveled all over the world to spread the word to save this majestic animal and the nature. Unfortunately the world lost him 23rd may 2003 in an accident.